Pawan Hans Limited Notification is out. Pawan Hans Limited is recruiting for 02 Junior Instructor And Workshop Demonstrator Post Posts. You can check Pawan Hans Limited - Pawan Hans Limited last date, download Pawan Hans Limited notification, visit Pawan Hans Limited official website and check other Pawan Hans Limited Vacancy details.Complete Vacancy and recruitment Details about 02 Junior Instructor And Workshop Demonstrator Post vacancies in Pawan Hans Limited are provided below by JobSarkari.Com only for you. Last Date of Apply Online. 27/07/2018. Last Date for Receipt of Application form 03/08/2018. SC / ST / PH No Fees. Mode of Payment Candidate Need to Draw a Demand Draft in favor of Pawan Hans Ltd, payable at Mumbai. Junior Instructor. Having BAMEL in any Category. Having Degree in Engineering in Aeronautical/ Mechanical/ Electrical/ Electronics/ Instruments Engineering. Having Diploma in Above Disciplines. Having 1 Years Post Qualification Related to Instructor Experience in Aviation Industry of As Mentioned in Notification. 01. Workshop Demonstrator. Having BAMEL in any Category. Having 1 Year Post Qualification, Related to Demonstrator Experience in Aviation Industry As Mentioned in Notification. 01. 3. Fill All the Mandatory Details in the Application Form And Download Complete Application Form. 4. Candidate Need to Apply Online Before 27th July 2018. Q. 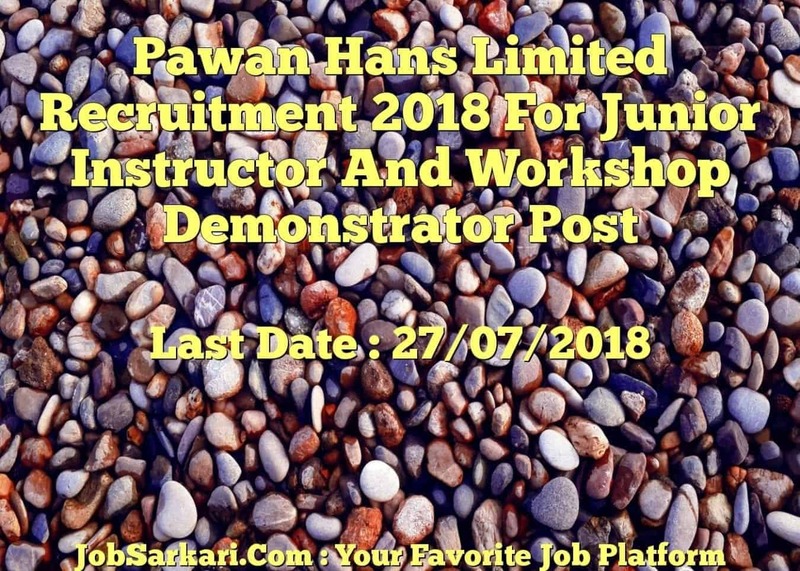 What is the Last Date For Pawan Hans Limited Junior Instructor And Workshop Demonstrator Post Vacancy ? A. 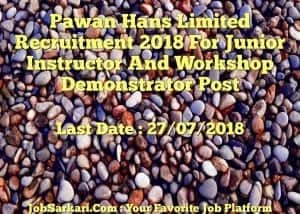 Last Date for Pawan Hans Limited Junior Instructor And Workshop Demonstrator Post Posts is 27/07/2018. Q. What is the Form Type of Pawan Hans Limited Junior Instructor And Workshop Demonstrator Post Recruitment ? A. The Form Type for Pawan Hans Limited Junior Instructor And Workshop Demonstrator Post Posts is Offline, Online. Q. How many vacancies are available in Pawan Hans Limited Junior Instructor And Workshop Demonstrator Post Posts ? A. There are about 0 Vacancies in Pawan Hans Limited Junior Instructor And Workshop Demonstrator Post Posts.